After E was born, and I had returned to the workforce, I made some changes in my life. I quit my job at the bank and went full time into the tax business. Life was great- I had two adorable sons, J approaching 2 and E about 4 months old. We laughed about how the transition from 1 child to 2 was harder than going from none to one, and how we could have another one right away, and totally handle it. This time it was early February. I was still nursing, but my milk production was weak with this pregnancy. I had mentioned that to my Ob-Gyn, and she suggested that upping the birth control method was a good idea. We talked about it, and because of my history of pregnancy while using oral contraceptives, decided that we'd try the patch. My conversation with the Ob-Gyn was over the phone, BTW, and she said "Run on past the office, I'll get you a month's worth of samples and a script." It took me a couple of days to get there, and the patch says to start on Sunday. Now, I know that the Sunday part is just to set a schedule. Fine. But there was also a little note. "If there is a chance you might be pregnant, take a test first!" No way. Not me, we just had a baby. Not pregnant. Right? Hmm. Well poop. So, off I went. New EPT, new time to pee on the stick at work. (Literally, I was at work ALL THREE TIMES I FOUND OUT I WAS PREGNANT. Is that normal!?) Totally pregnant. And a little bit shocky. A co-worker showed up and found me on a desk, just sitting there, staring into space. Looked straight at me and laughed, said to me "You're pregnant again, aren't you!?" So, we did it all again. Only this time, when we did the whole labor and delivery thing in October of 2003, the little girl in my womb showed she had every intention of being the drama queen. I was at better than 5 cm's when I called the crew (from the McDonald's drive through- they liked to starved me to death having E!) and headed up to the hospital. A few hours later, M's heart rate dropped a bit during a contraction. Then, again in the next one. I proceeded to spend another hour or so trying to flip, flop, oxygenate, and whatever else to make sure that her heart rate stayed stable. It didn't. We got to 9.5 cm's and pushing, when I had a contraction and her heart rate dropped into the 60s and didn't come back up. At 4:45 pm I was pushing in a delivery room. At 5:02, they surgically removed my daughter from my womb. It was the most frightening 17 minutes of my life. The doctor was never able to determine why she was so intolerant of the labor. Cord was fine, placenta was fine. But I know why. Really, our M is the master of all things dramatic. It's over the top, all the time. Some days, it's great. I wish I had the energy and enthusiasm for life that she does. Other days, it wears me out! She's all girl, which is hard for me. She's just started Kindergarten, which is a whole new world for her. She's adorable, and she knows it, she's got her daddy's heart, and her grandpa's and uncles cannot tell her no. And I love her to pieces! 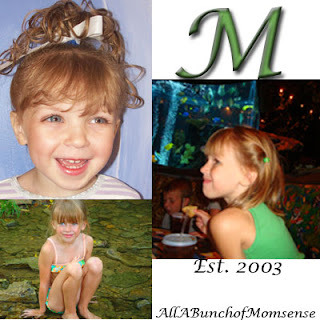 Found your blog through Tamara's, and love your point-of-view as an experienced working mom. Even a year in, it's still something I'm getting used to and I hope to learn a little from you! Feel free to pop by and check out my blog, if you feel like it. I was working full time when I found out I was pregnant with my 3rd, also a girl, also unplanned, also complications during labor and c-section, AND she's also a drama queen! We need to get these two together! haha! Hey! Been meaning to stop over and say hello! LOVED your comment on my Aunt Flo post...TOM--too funny! This post was adorable...but how very scary for you with her delivery...little stinker! Main thing is she's healthy and here, right?!! Oh, and I've had the shock factor too...with, well, all five of my babes! Cute stories! You have a beautiful family and blog.